How Does The Moon Stay “Suspended” In The Air? This question has two answers: elementary and subtle. The elementary answer stems from Newton’s laws of gravity. A complete answer, however, was only worked out by Einstein at the start of the last century. A the simple answer to “why does the Moon stay suspended in the air?” is this: There is a gravitational force between the Moon and the Earth, that tries to pull the Moon toward the latter. This constant tug on the Moon as it moves around the Earth is called a “centripetal” force. This force is balanced by the “centrifugal” force, that pulls on the Earth and keeps the moon in motion. For a technical description of the (subtle) difference between centripetal and centrifugal forces check out this page. It is the balance between the centripetal and centrifugal forces that keep the Moon in orbit around the Earth. One can be more persistent than that, however, and this is where the subtlety comes about. Why do the centripetal and centrifugal forces exactly balance each other? Because otherwise the Moon would come crashing into Earth. But why does the Moon not come crashing into Earth? Because the centrifugal force exactly balances the centripetal force. The reasoning here is circular: the simple explanation above provides a way of understanding how the Moon stays in orbit around the Earth, but not exactly why. The why was only supplied by Einstein in the early 1900s. A more thorough answer to “Why does the Moon stay suspended in the air?” is the following. We think that Einstein’s Theory of General Relativity explains the properties of space and time in the Universe. Within that theory, objects with mass curve spacetime in their vicinity, and this curvature influences the motions of other objects. The greater the mass and density of the object, the larger the curvature of spacetime that results. So, the Moon orbits the Earth because the Earth curves space-time in the vicinity of the Moon. 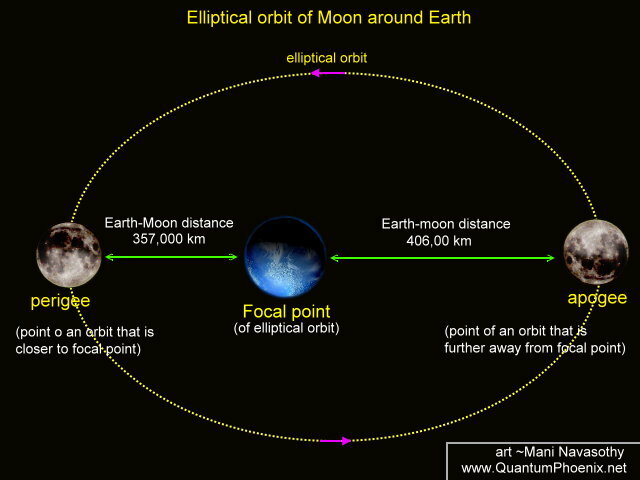 Though the Moon itself curves space as well (since it has mass), the curvature in the vicinity of the Moon is dominated by the Earth, which “tells” the Moon to orbit the Earth, given the Moon’s current position and motion in the sky. It is this interplay between mass and curvature that causes the gravitational and the centripetal forces in the first place, and thus why the simple explanation holds. First case: – Why does the Moon orbit the Earth? It just does. And you can understand how it does by analyzing the forces on the Moon caused by its orbit and finding the forces pushing in and out are equal.